All you need to know about photography from how to hold the camera, to how to edit the pictures with photoshop to publish them. A great introduction to the passionate world of photography. This Workshop will be divided to four sessions, each of 3 hours, during saturdays most probably, from 3 to 6 in the afternoon (on weekdays sessions start at 6:00 pm). We will also have a field trip to experiment with the techniques we learn. Location to be announced. cost: 75$ for the three hours session or get 20% discount and get all four session for only 240$ (total of 12 hours) - Ask for students special rates. • How the camera works? - Do i need a professional camera to attend this workshop? No need to have a professional camera to attend. Of course, this means you won't be able to try all the techniques we will be talking about, but still, you can learn everything we will be talking about and you might decide to get a new camera if you find yourself really interested and want to take your skills to the next level. - Will I get a certificate? Well, somehow. 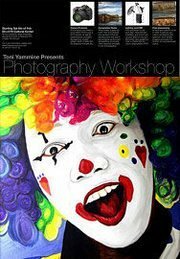 For the people that will attend this workshop and continue to take the advanced workshop, you will receive a paper stating that you've covered these topics of photography.